A New and Exhilarating Flying Experience! A “His and Hers” flight in TWO open cockpit double wing biplanes flying in close formation. With each of you sitting in the front seat of one of these vintage biplanes you can photograph each other whilst being flown by our experienced pilot/instructors. You will have the chance later on to fly the aeroplane yourself, or even experience some aerobatics in one of these lively and evocative 1940s aeroplanes. The flight time is 30 minutes taxi out to taxi in and you will experience not only the breathtaking views over the Weald of Kent, but see firsthand what it was like for those fighter pilots of years gone by, to fly in close formation as they ventured out on patrol. Of course it can also be “Just for the Chaps” or “Girls only!” the only requirement is that you enjoy this Air Experience Flight to the max! 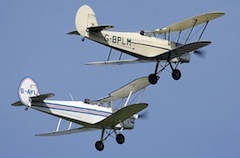 This package is just £325.00 for both aircraft all inclusive. It is a great gift that you can take part in too! A present for both of you! These flights will be undertaken in a Stampe SV4 biplane although on request one of them may be in a De Haviland Tiger Moth, but for operational reasons we cannot guarantee it, but contact us for further details. You can email us here and we will respond usually within a couple of hours.